Authors: Sotova I.A., Kolesova N.N. The article discusses the concept of a medical professional speech as a specific type of communication. The mastering by medical professional speech is a necessary component of the content of learning the Russian language for medical university foreign students. 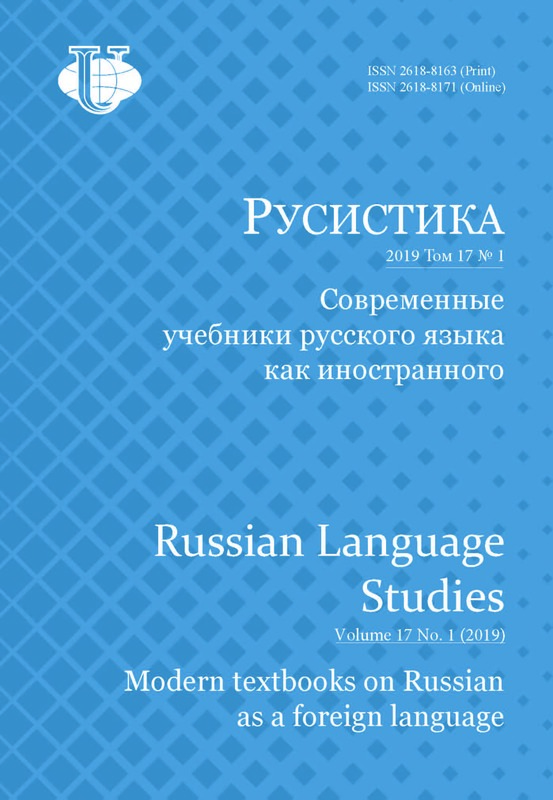 The conclusion was made that it is necessary to rely on typological genre description of oral medical discourse, to use the special system of exercises and tasks in the process of teaching the professional Russian speech. professional speech of medical worker, speech genre, medical discourse, genre oriented approach to teaching the professional Russian speech, foreign medical students. The appearance of the research devoted to professional communication, professional speech of the specialists who work in different spheres of professional activity such as pedagogic, medicine, economics, law, etc. led to the search of new effective ways for the communication development of foreign students in Russian Universities.According to the methodics of teaching Russian as a foreign language the foreign students’ communication competence is considered to be the aim of achieving a required level of communication. As to the professional communication it is personal readiness for the professional interaction is considered to be the most important in all fields of human activity. The communicative competence is the achievement of a definite level of a personal and professional experience of a person interaction with all people around him/her. This experience is needed for a person so that in the range of abilities and social status one can function successfully in a professional field as well as in the society [13.P. 206-207]. Mastering the professional speech helps the specialists foresee the way of communication, plan it correctly, react adequately the communicative actions of the partners and achieve the required aims.The use of professional speech is due to the existence of a group of language carriers for whom the usage of a given type of the language is connected with the fulfilling of a professional activity. L.K. Graudina and E.N. Shiryaev state that special themes, special aims of the discussion force the specialists to use the professional language, which to a lesser degree is connected with nationality of the language carriers and must not depend upon social economics formation, upon the ideology and world vision [9. P. 171].In scientific and methodic literature there does not exist a single definition of the term«professional speech» which is due to the fact that it has many meanings and is due to the attempts to give its definition from different points of view.We share N.K. Garbovskiy’s view point who considers that professional speech is communication. In the work “Comparative stylistics of professional speech (on the material of Russian and French languages)” he writes: “Communication among thespecialists on the professional themes which does not depend whether it proceeds in written or oral form, in official or unofficial ways» is the professional speech itself which is a peculiar, auxiliary type of activity which ensures the implementation of the main activity” [7. P. 38].The problem of forming the skills of professional speech is very urgent in the process of teaching future doctors for whom a good professional speech is the base of getting professional knowledge, of forming professional competence and acquiring the profession. Successful communication is one of the main criteria of professionalism.The improvement of medical technologies, development of new medicine and innovation treatment methods allow the humanity already today to overcome many illnesses which were considered earlier to be incurable, to carry out less traumatic operations, to give the people the joy of good well being. At the same time a qualified doctor who is ready to listen to a patient, to cure not only body but a soul as well, ready to understand and to help is the main condition of successful treatment and curing.The communication in the medical sphere is a peculiar type of communication which accompanies the practical activity of medical specialists. The texts created by medical specialists contain the information accepted in the given professional community and which is understandable for professional specialists. The communication in the field of medicine proceeds mainly according to a man - man system (often according man - medical apparatus - man system).As a result of the analysis of scientific works and our own observations we have come to the conclusion that professional speech of a medical specialist is a specific type of communication, namely - speech interaction of specialists in the most typical situations of professional communication in the process of solving communication-speech tasks in the medical sphere.Professional speech of medical specialists contains exact and programmed speech which is due to the speech situation. Professional speech is realized depending on communicative-pragmatic situations oriented on a recipient of a communicative interaction. A recipient is another medical specialist (doctor, medical sister) or a patient (patient’s relative).Communication competence of a doctor is a complex speech skill which allows arranging and regulating correctly different types of interaction applicable to the situations of professional communication.Medical specialists use in everyday communication professional lexis (terminology, professionalism, slang) as well as neutral words. In the situations of a “doctor - patient” communication the speech of medical specialists is close to the speech of patients. Therefore we observe in the professional speech of doctors a lot of language means which belong to conversation speech: addressing in diminutive-caressing form, repetitions, etc.E.V. Vinogradova, I.S. Bandurist studying the peculiarities of discourse semantics in the process of «doctor - patient» communication note the communicative skills of a doctor consists of the skill of using a definite speech models such as cliché, professional lexis according to the aim of a talk with a patient, clinical situation, branch of medicine [14. P. 51].The main form of oral speech interaction in a professional field is dialogue communication (V.N. Dyakova, V.B. Kurilenko, S.V. Matalova, etc.). The types of adialogue are questionnaires (of a patient), medical history, a talk (with medical staff, patients, relatives), which may be thematic, information, business, etc.The development in the methods of teaching Russian as a foreign language the concept of genre oriented approach to the teaching of Russian the foreign students (O.A. Chistyakova , A.S. Hechtel , etc.) shows a growing interest of researchers to the study of speech genres of specialists. New modern professionally oriented methods of teaching Russian to foreign students start to be developing. Teaching professionally oriented significant speech genre is in the centre of the researchers attention in different fields of activity.Modern linguistics uses the term “speech genre” as one of the most applicable mechanisms when considering the situations of language use, mechanisms of speech production and interpretation the speech [6. P. 157]. According to V.V. Dementyev the theory of speech genres is a communication model which takes into account definite situation, communication sphere, style, speech form, initiative transfer in a dialogue, strategy and the way of dialogue managing.In a modern linguistics a genre is considered to be a discourse unit. There are different views of the linguists on the discourse understanding in science. We rely on the interpretation of discourse notion given by E.G. Azimov and A.N. Shukin. The authors underline the modern linguistics considers the notion discourse as the activity which includes a language as an initial material and which is realized as a speech. If discourse is a process then the result of this process is the text. Thus, some types of speech activity are not called the speech (speakers’ speech, lawyers’ speech) but they are called discourse [1. P. 63].At present a medical discourse is a subject of the research of foreign and Russian scientists. There appeared the dissertation publications by E.V. Akaeva, M.I. Barsukova,N.V. Goncharenko, V.B. Kurilenko, V.V. Zhura, etc. in which the scientists describe a medical discourse as a complicated, multicultural and many-component phenomenon in a language [2; 3; 8; 11; 15]. A medical discourse which is one of the ancient discourse types is on the crossing of the interests of different disciplines such as linguistics in its broad sense and cognitive linguistics, sociology, deontology, ethics and psychology.E.V. Akaeva analyses medical discourse communicative peculiarities. In her work “Communicative Strategies of Professional Medical Discourse” the author notes that the doctor’s speech action on a patient follows cognitive and communicative aims such as changing the picture of patient’s word, convincing a patient in the necessity of a definite method of treatment, creating the psychological comfort atmosphere, awaking the confidence to doctor’s professional skills and competence . V.B. Kurilenko says a medical discourse is a sphere of professional communicative interaction of medical specialists. Thus a discourse has such characteristic features as deontological orientation, tolerance, persuasion . L.S. Belinson studies a medical discourse from the point of view of social linguistics. She points out this type of discourse is described on the base of significant peculiarities which a doctor possesses .According to basic characteristics a medical discourse refers to institutional or status- oriented types of discourse interaction among the people. According to V.B. Kurilenko,Z.N. Makusheva, etc. linguo-therapeutical direction should be considered as the main medical discourse category.The genres of medical discourse are the subject of modern linguistic research(M.I. Barsukova, L.S. Belinson, V.V. Zhura).V.V. Zhura in her research gives the definition of an oral medical discourse genre which is a stable, pragmatically defined, verbalized form of cognitive communicative activity which accompanies a typical event in a medical professional sphere . In her opinion a discourse doctor’s competence is an integral form of number of competences, such as thesaurus competence, extralinguistic, genre competence, strategic (interactive), speech, paralinguistic and emotive.As main genre forming characteristics of the discourse under study the author underlines the aim of communication, a linguopragmatic characteristics of a discourse, a cogniotype reflecting semantic structure formation of oral medicine discourse as a frame, scenarios, models of subject-reference situations [15. P. 6]. As system forming signs the author names institutionality, ritualization, personality, asymmetry, intellectuality and psychology. From the point of view of the structure the author underlines two components, namely common gnostic and operational in a discourse competence.Professional speech situations in the doctor’s activity are numerous and that is why there exists the genre-stylistic variety of medical discourse. Every genre of a professional speech for medical specialists has its own aim and depends on the communicative- pragmatic situations oriented on a person of communicative integration, namely “a doctor - a patient”, “a doctor - a nurse”, “a doctor - colleagues”, etc.The problems of mastering professional speech for foreign medical students refer to all levels and aspects of speech culture and the least methodically worked out in genre- style aspect.The main task of methodological support creation for professional preparation of medical students at higher establishments is the acquaintance of the students with typical situations of professional interaction and with a number of genres which are used in these situations. In our view point the model of forming professional speech of the medical students should be based on the system forming and genre characteristics of a medical discourse.Modern linguistic publications devoted to a medical discourse contain the information about a genre content of professional medical speech and it allows to raise the problem of selecting the genres of medical discourse in methodical aspect. At the same time the realization of genre approach to the professional speech teaching of medical students is rather difficult because the genres of oral medical discourse have been studied insufficiently and there is no a unified view point on the given genres.We have carried out the questionnaire of therapists of some medical institutions in Ivanovo aiming at defining speech genres which are frequently used in the sphere of medical activity. We have found out that medical specialists use regularly such genres as “Consultation”, “Convincement”, “Сonsolation”. They characterize not only professional speech of medical specialists but they are used for the communication of a doctor and a patient. In the opinion of respondents such genres as “A patient distance consulting”, “Doctors distance internet-consulting”, “Consilium”, “Questioning patients”, “Written consent of a patient”, “Thematical talk of a doctor with a patient” refer only to the medical sphere.We are confident that teaching genres of medical discourse must include the knowledge about thematical structure of doctor’s discourse, the models of speech situations, speech forms, lingual and extra lingual means, strategies and tactics as well as the knowledge about scenarios of professional medical communication and the development of skills tounderstand and construct speech utterance taking into consideration significant features which define the peculiarity of a selected genre.Taking into account the content and characteristic features of doctor’s discourse competence we have worked out a system of exercises and tasks which can help a form oral professional speech of medical foreign students who know Russian language in the volume of the second certification level.Teaching special subjects and mastering professional speech have to be carried out as interconnected and interdependent processes.On the lessons of Russian as a foreign language special attention is paid to the genre of thematical talk, which is obligatory in the process of forming the skills of professional speech and which allows to form professionally important skills for foreign medical students: 1) the skills to ask questions, to understand the answers, to react adequately aiming at getting the information about general state, possible reactions of illness, the conditions which are possible reasons of illness, character of displaying the symptoms of the illness, localization, irradiation, duration and repetition of the symptoms; 2) the skills to have a talk with a doctor about patient’s state, about etiology of illness, about possible analyses, the results of the investigations, about the treatment scheme, the dynamics of a patient’s state.The solution of the communicative tasks and fulfilling the exercises based on authentic material, role games which envisage the readiness for producing the monologues and dialogs of various types, the analysis of cases, presentations on a given theme, prepared discussions are organizational forms of mastering speech in a professional sphere.We give the students for learning oral forms of professional speech as these genres of medical discourse are more complicated for foreign students as compared with written genres.Mastering the genres of professional speech is for foreign students a very important condition of successful learning special subjects, passing a clinical practice in hospitals and confident speech behavior in the situations of speech communication. Copyright (c) 2016 Сотова И.А., Колесова Н.Н.